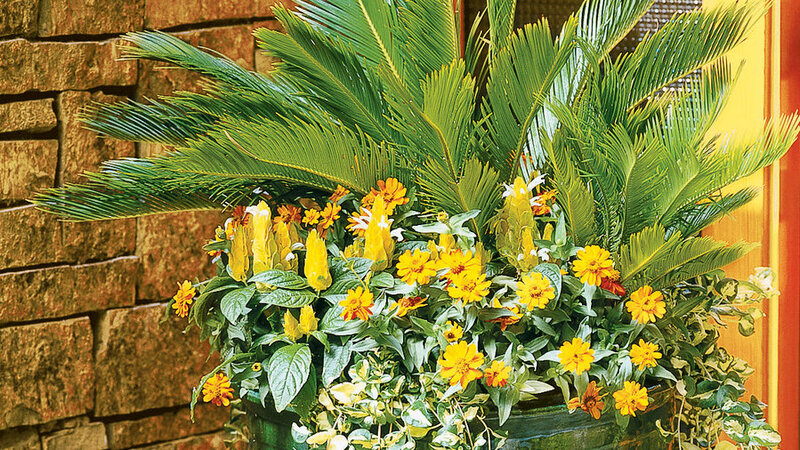 SPRING-SUMMER: Sago palm anchors this composition in a 22- by 24-inch glazed urn. Below it are 'Orange Profusion' zinnias, yellow Pachystachys lutea, and trailing variegated vinca. Container plantings that look good all year long are floral designer Jean Manocchio’s specialty. Manocchio creates many such plantings every year for her clients at Belli Fiori in Redwood City, California, so she has developed strategies for simple but spectacular living bouquets that need sprucing up just twice a year. She starts by anchoring the arrangement with a single plant that can live year to year and look attractive in every season–a weeping blue Atlas cedar, Japanese aralia, or sago palm, for instance. To accommodate the rootball (such plants are typically sold in 1- to 5-gallon pots), Manocchio sets it in a container partially filled with potting soil. She then builds a composition around it using annuals, bulbs, ground covers, or perennials. Some arrangements feature foliage plants with interesting textures and forms; adding a few bulbs or annuals for a spot of color every spring and fall is usually all that’s needed. For added drama, Manocchio sometimes also packs in colorful, long-blooming plants, then replaces them at the season’s end. Determine the site. Locate the pot where it will be most visible― by the front door, on a patio, or in view of a window. Select a container. It should be in scale with its surroundings (a large pot can overwhelm a small entryway), and in a style and color that go with your house’s architecture. Be sure to choose one that will look attractive with the existing plants that grow nearby. Make sure it has drain holes. Design the planting. Colors that match the flowers and foliage already growing in your garden have a unifying effect; contrasting or complementary colors create a visual diversion. If the container will be viewed from indoors, you may prefer to take color cues from your home’s interior. Also consider style. Do you want a casual planting or a sculptural one? Bold or lacy? Vertical or horizontal? Tall or short? Choose plants accordingly; group them on a cart at the nursery to see how they’ll look together. Watering. Be diligent about irrigation, especially for plants that need lots of water to thrive. Manocchio uses a drip system that is connected to an automatic controller, but hand-watering also works. Feeding. For an extra boost during the growing season, give plants a shot of water-soluble fertilizer, diluted according to directions. Refreshing the planting. When flowers and foliage start to fade on filler plants such as annuals and bulbs, replace the plants, adding fresh potting mix and controlled-release fertilizer before replanting. Select your anchor plant first. Choose one that’s suitable for the pot’s style, location, and exposure. Make sure they grow shorter than the anchor plant, share its cultural requirements, and harmonize with its colors and textures. New Zealand flax with pink-toned leaves, for example, blends well with pink flowers. Add trailers such as bacopa and vinca to soften the pot’s edge. Spring fillers: In addition to the many annuals, long-blooming perennials, and bulbs (particularly tuberous begonias and dahlias) sold in bloom at nurseries, many houseplants make lovely additions to container plantings once the weather has warmed. Fall fillers: In mild climates, many plants suitable for containers are sold in bloom in fall, including chrysanthemums and violas. In colder climates, use hardy foliage plants with interesting color and texture, such as ornamental cabbage and kale, and underplant them with spring-blooming bulbs.